Dr. Merezban Katrak completed his M.B.B.S from Mumbai and obtained his DNB in Surgery from National board of Examination, New Delhi. He attained his M.R.C.S (General Surgery) from The Royal College of Surgeons of Edinburgh, UK in 2001. He has had a brilliant post-graduation career and did his Fellowship in Minimal Access Surgery from Sir Ganga Ram Hospital, New Delhi, India under Dr. Pradeep Chowbey. He also underwent training in Haemorrhoidal THD procedure at Policlinico Gemelli Hospital, Italy & Laparoscopic Hernia surgery in Imelda Hospital Bonheiden, Belgium. Dr. Katrak is a member of the prestigious Royal College of Surgeons of Edinburgh, UK, Indian Association of Gastro Intestinal Endo Surgeons (I.A.G.E.S), National Academy of Medical Sciences, New Delhi, the Indian Society of Gastroenterologist – Middle East and Asia Pacific Hernia Society. 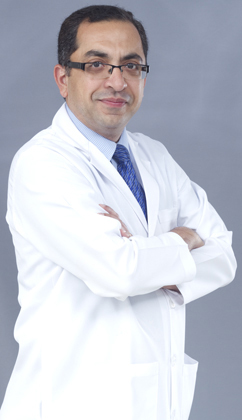 Prior to joining NMC Dr. Katrak was working in the reputed BLY Nair Hospital , Mumbai, India where he worked in the GESS (Gastroenterological Surgical Services) Department dealing with a vast range of Hepaticobiliary and Colorectal surgeries. He has held the post of Casualty Medical Officer where he handled a large number of trauma cases. In NMC since the last 12 years Dr. Katrak has rich experience in major abdominal surgeries, minor day care surgeries along with laparoscopic Hernia, Anorectal, pilonidal, varicose vein and Breast surgeries. His special area of Interest is in laparoscopic surgeries especially hernia surgery, gallbladder surgery, and Haemorrhoidal THD procedure. He has a number of international publications, articles and scientific presentations to his credit. Dr. Katrak is fluent in English, Hindi, Urdu and Gujarati.